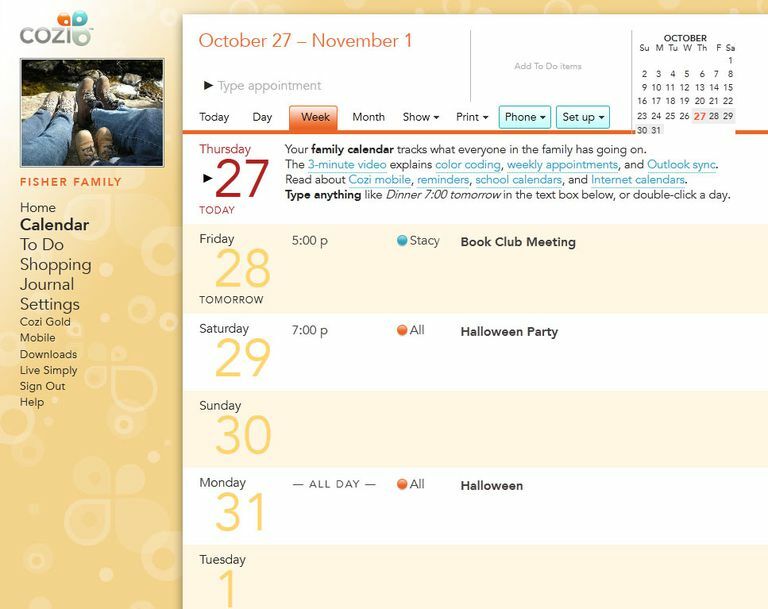 Cozi is a free online calendar that lets each family member have their own calendar as well as a shared family calendar. Besides the main feature of the calendar, you'll also be able to create to do lists, shopping lists, and keep a shared family journal. The main reason to use Cozi is for the family calendar. The calendar is pretty easy to setup and I was up and going in a matter of minutes. After I registered I added a family photo, basic information about my family members, and then starting adding calendar entries. Entering calendar entries (Cozi calls them appointments) is super easy to do and holidays are already in there for you. Simply click on the day and then start typing. After you've typed the information you can then set a time for the appointment and assign it the whole family or only certain family members. There's a color assigned to family appointments and then each family member has their own assigned colors just for their individual activities. This makes it very easy to glance at the weekly view and see who has what going on. I was disappointed that there wasn't color coding for the monthly view of the calendar and the entries looked sort of messy. You can also view the calendar by day which has a breakdown hour-by-hour of each day. What makes Cozi really stand out is the free smart phone apps (iPhone, Android, and Blackberry) available as well as a great looking mobile website. This makes it so easy to coordinate when you're on the go like most busy families are nowadays. You can even send a grocery list or to do list straight to your spouse's or kids' phone by text message. You can also easily sync Cozi with Outlook, making it really easy to update schedules if you're an Outlook user. Besides the main feature of the shared calendars, you can also do quite a few other things with Cozi. With Cozi, you can create a shared shopping list which all family members can access, create to do and chore lists and quickly send them to the family, and keep track of special moments in an easy to use family journal. I think Cozi is perfect for a large family on the go. The ability to send text messages for new appointments and to do lists makes this a must have if you have busy teens in your house. If you find yourself constantly wanting a monthly view of your calendar then you might want to try out a different online calendar.